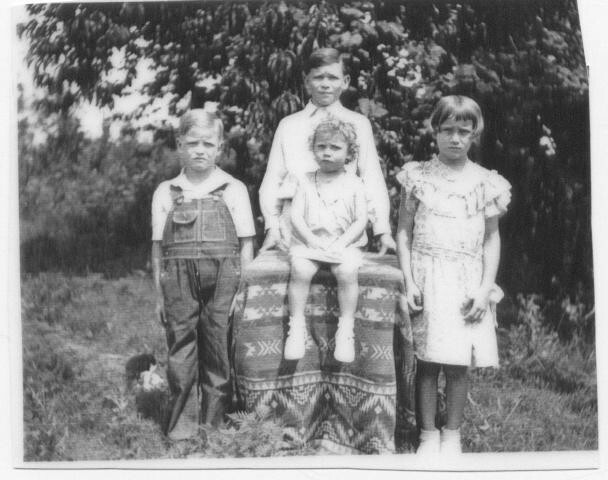 Pictured here are 4 of the Ramsey children. Left to right - Reed, Al G., and Eudean. Delilah is seated in the center. The name Ramsey and the Independence Community of Overton County have been linked for many generations, and that connection is still strongly in tact today. The family of Luther Ramsey and wife Etta (Ray) Ramsey, whose home place lies not too far from the Independence school, raised a large family of seven children during the late 20's and 30's. Their children’s names were Al G., Lehman, Udean, Reed, Delilah, Donald, and Gwendolyn. My journal entry this week will focus on an unforgettable overseas voyage made by one of their sons when he was only 17 years old. But first of all, we’ll begin with another trip that same son, Reed, made when he was rushed to Nashville in an effort to save his young life. It was 1938 when Reed indulged himself in too many walnuts, or so everyone believed to begin with. After being sick for much longer than eating too many walnuts should have made him, Reed’s father took him to see Dr. Capps. That was when the diagnosis was made that the walnuts had made him sick. When he didn’t improve, Dr. Sidwell paid a visit to the Ramsey home, and after examining Reed, he advised his parents they must get him to Nashville as quickly as possible. Necessary arrangements were made for the trip, and after arriving at St. Thomas Hospital, the doctors who treated Reed, Dr. W. D. Haggard and Dr. J.A. Kirtley, Jr., were both fearful he might die. So it was in the elevator surgery was performed to remove a ruptured appendix. Reed spent twenty-two days in the hospital, and when the day finally came that he could be discharged, one of the doctors asked Reed’s father, Luther, about being paid. Mr. Ramsey explained that he had no money to pay for Reed’s hospitalization, so an arrangement was worked out to cover the total costs of $75.00 for those twenty-two days and the services of two doctors. Clyde Stover of the Independence community agreed to loan Luther Ramsey the $75.00 owed for Reed’s doctor and hospital bills in exchange for a mortgage on not only Reed’s father’s farm, but Reed’s grandfather Ramsey’s place, his Uncle Willis Ramsey’s place, and his Uncle Bradley Ramsey’s farm as well. All this property stood good on a note and was held by Mr. Stover until paid in full. Reed still has a copy of the note his father and the other relatives signed. Among some of other papers saved from that hospital stay is a letter written to Reed’s mother on March 29, 1938, by Dr. Kirtley advising that Reed was going to be alright. We move on now to 1946. Reed was only 17 years old when a man named Jimmie Dills asked him and a cousin, Castle Ramsey, about going on a trip with him. Without hesitation and without having any idea what they were in store for, and after getting permission from their parents, they both signed up for the trip. After the necessary arrangements were made, they, along with Mr. Dills who arranged for the trip, boarded a bus in Cookeville headed for Newport News, Virginia. After arriving in Virginia, Reed wrote a letter to his parents giving them some details about what he thought at the time was going to be a real adventure. He tells how they went to Norfolk to get their seaman’s papers, and that on Monday, April 23, 1946, they would be leaving by ship for Danzig, Poland. They had been told at first they would be boarding the Hattisburg Victory ship, one that carried cattle, but as it turned out, the ship they were placed on was the Bucknell Victory ship. The Bucknell would be transporting 775 horses along with two decks of hay. In addition to the horses, there were around 50 men on board. The purpose of the trip was to provide relief to countries such as Poland that had been invaded by the Russians. The conditions were so bad in Poland at that time, people were glad to even have garbage from these large freighter ships to try and exist on. The program that allowed young men such as Reed and Castle to go on these ships carrying horses and livestock was known as United Nations Relief and Rehabilitation. Many years later, Reed obtained a copy of a book published in honor of what was referred to as Seagoing Cowboys. Contained in the book is an advertisement from a newspaper printed in 1946 that says: "Help Wanted. Two thousand men wanted to serve as livestock attendants on board UNRRA ships carrying livestock to Europe to replace killed-off animals. Applicants must be able to work with animals, willing to do manual labor, and of good moral character. Men especially desired who will conduct themselves without reproach in foreign ports. Age 16-60. Trip takes 4 to 6 weeks. Pay $150.00 per trip. Apply Brethren Service Committee, New Windsor, Maryland." The trip from Virginia turned out to be more of a nightmare rather than an adventure for those on board. The ocean voyage was so rough, most, who had never been on a ship before, as was the case with Reed, suffered greatly from seasickness for much of the trip. The boots Reed wore had buckles on them that soon turned to rust from being exposed to the salt water from the ocean. Bunk beds in tiny little quarters were provided, three bunks high, and it was necessary to be buckled into them in order to stay put during the night. A young boy died on another ship going on this same journey. His body was wrapped in a sheet and dropped overboard. As the ships approached Dover, England, it was necessary to have someone familiar with the area to board the ship and direct them around other vessels that had become shipwrecked while making similar voyages. Conditions for the horses on board were far from ideal as well. They were placed in the ship side by side and were rigged into a standing position only. The entire trip, these animals could not move forward, could not move backward, and being able to lay down was completely out of the question. A piece of equipment similar to an front end loader was used to scoop up feces to be disposed of in the ocean. Those horses who didn’t live to set foot on solid ground again were picked up by a large crane and dumped overboard. And, as strange as it may seem, when the ship arrived at its destination and unloaded the horses, their number was greater than when the trip began. Many horses never lived to complete the journey, but those mares who were pregnant when they boarded gave birth during the trip. After spending a few days in Poland, Jimmie Dills decided to see some of the countryside. He was able to locate a jeep and Reed accompanied him on a drive. It wasn’t long until the trip was cut short due to the fact they had run out of gas. It was then that a young boy Reed describes as being around 10 years old appeared. It is uncertain if he was an American or possibly English, but whatever the case, he could speak English. He told them how he was living on his own underneath a concrete porch of a home nearby and that both his parents were dead. They inquired if he knew how they could return to the place where the ship was docked, and he told them the best way to get back would be by train. He took them to a place where sure enough they were able to get on the train, but not as regular passengers, but as hobos. Everyone took a real liking to the young man, and hated to think of leaving him behind. What to do with him was discussed and it was decided to ask a couple of the Russians guards if he could come back to the United States on the ship with them. The guards talked it over, and agreed he could do so, only if they were given a carton of cigarettes. The deal was completed and the boy was smuggled on board. After the return journey began, everyone saw to it that the boy had plenty to eat. He was always included in the playing of cards or any other ways those on board spent their spare time. The return trip ended sometime in May of 1946 back in Newport News, Virginia. When the ship docked, the Coast Guard came on board and the extra passenger’s presence was found out. He was taken by the Coast Guard and to this day, his whereabouts is still unknown. This is something that has bothered Reed since that fateful day the ship returned from Poland. He has been back to Virginia twice to try and locate any information that would lead him to the young boy. He says its something he will always regret, but still holds on to the hope that he might still be able to find him. The only information he was able to learn is that the ship they traveled on was docked in San Diego in the year 2000. This young man would probably be around 68 years old today. One of Reed’s greatest wishes is to be able one day to shake his hand once more. After completing high school, Reed went on the attend Tennessee Tech and has been retired now for sometime after working for 35 years as an insurance adjuster. His family includes one daughter, Linda Thornton, two grandsons, and two great-grandchildren. He continues to farm since his retirement. He also owns the old family home place near Independence. In spite of the extreme conditions aboard ship, and dealing with not only being seasick but extremely homesick as well, his ocean voyage adventure as a young 17 year old will remain with him always. But wouldn’t it be wonderful if the next chapter of this story included the reuniting of Reed and the young man he befriended so many years ago. What a happy reunion that would be! And what about all the years in between? What a fantastic story that would be! !